I’m writing this at 11:12 AM on Sunday February 9, 2014. 50 years ago, at this moment, America at large was mostly unaware of a group of four long haired lads from someplace in England called Liverpool, though a persistent gnat-like buzz about something called The Beatles was infiltrating their consciousness via a building media feeding frenzy. That evening, introduced on The Ed Sullivan Show, the Sunday night staple of family television viewing, 73 million people tuned in and everything changed. 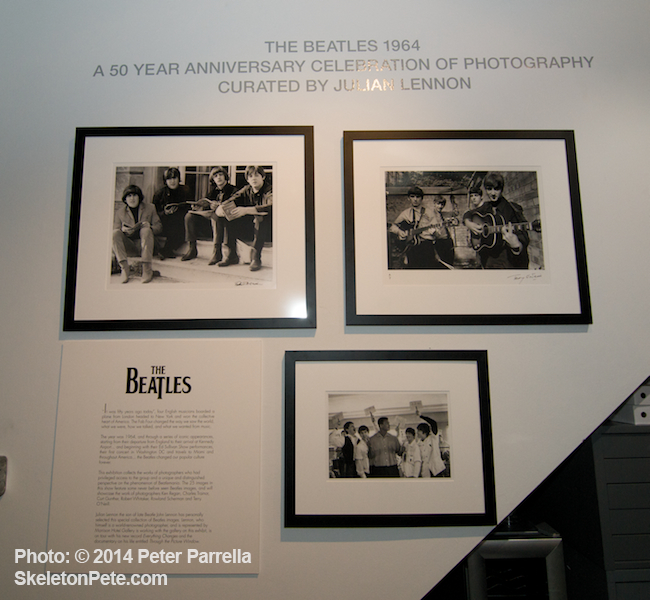 The Morrison Hotel Gallery in SOHO NYC launched their Beatles 50th Anniversary Photo Celebration with a bustling opening night event. As a February 1964-2014 celebration The Morrison Hotel Gallery has mounted a 30 image collection, curated by Julian Lennon, mostly focused the events of the Fab’s American arrival, first US concerts, and Sullivan show appearances. Guests crowded the gallery’s opening night event, discussed their favorite images and the influence that The Beatles have had on their lives, to a background of the Sullivan show performances. 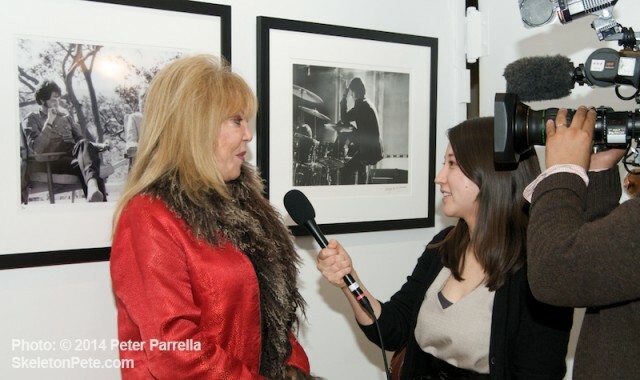 Pattie Boyd discusses her photo work and Beatle lore with Erina Aoyama of Japan’s NHK Broadcasting. There are plenty of iconic images, like the Fabs’ emerging from the airplane in New York City to screaming fans, along with a nice selection of shots new to even those of us who have been following along since 1964. Of interest to photographers will be Robert Whitaker’s proof sheet from the Sullivan show appearance. Along with the familiar on-stage and staged images we’re treated to a number of peeks at the group behind the scenes. These fly-on-the-wall moments, in the back of a limo or relaxing in a hotel room, nicely balance with the running, jumping, standing still PR confections. They are like a look inside the eye of a publicity hurricane. Photographer Charles Trainor captured future world wide icons on the rise in 1964. 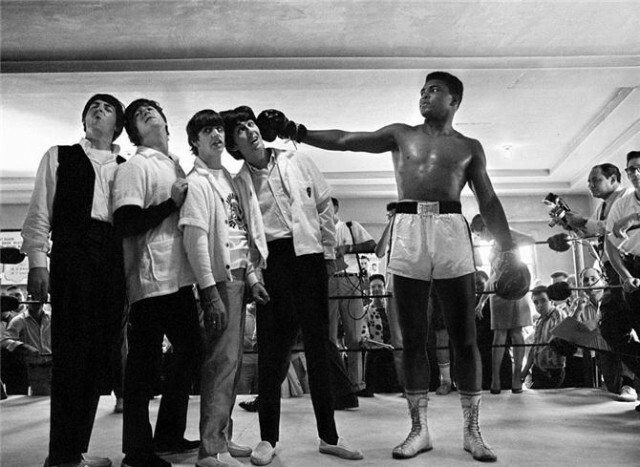 Charles Trainor’s documentation of “the boys” Goon Show style encounter with Muhammed Ali (then Cassius Clay) still stands as a brilliant, though last minute, press coup that in its time seemed to legitimize the careers of each burgeoning star. The Morrison Hotel Gallery exhibit includes the work of the aforementioned Trainor, Whitaker and Boyd, along with images by Curt Gunther, Terry O’Neill and Ken Regan. Limited Edition prints are available for purchase in a number of sizes. The exhibition runs through February at the Gallery’s Loft space, 124 Prince Street, 2nd floor, SOHO, NYC. I was 9 years old when that first Sullivan Show appearance was broadcast. As with so many others, The Beatles became part of my personal timeline and their artistic growth always of interest, but nothing ever really matched the sheer exuberance of that experience. As someone who in the past has surreptitiously used February 9, 1964 as the Facebook birthdate for my own band, it was great to meet so many people who have only experienced The Beatles in historical retrospect but are appreciative of that performance which turned into a cultural watershed.